What is the Bernedoodle’s temperament like? How do Bernedoodles compare to Goldendoodles? What are the generations of Bernedoodles? What are the major differences between tiny, mini and standard Bernedoodles? What is the difference between male and female Bernedoodles? What are the grooming requirements for a Bernedoodle? What are the health concerns for Bernedoodles? How much exercise does a Bernedoodle need? How should I choose a Bernedoodle breeder and what should I look for? What is your long-term goal for your breeding program? Why are you adding Australian Labradoodle lines to your breeding program? Is there a significant difference between an Australian Bernedoodle and a regular Bernedoodle? How do I go about adopting a puppy? Why is the wait for a Bernedoodle so long? Why can’t I choose my own puppy? How do you assess a pup’s personality? How do you decide which puppy best suits my circumstances? Can I visit the kennel and see my puppy and its parents? Why are your prices higher than those of some other breeders? The Bernedoodle is a cross between a Bernese Mountain Dog and a Poodle. I was the first breeder to deliberately breed these dogs. I had bred Goldendoodles and purebred Bernese Mountain Dogs for many years, and people kept asking me to combine the Bernese and Poodle. I finally decided to give it a try and was very impressed with the results. The pups were stunning, and they grew into healthy family dogs with amazing personalities. I have gone on to breed many Bernedoodles—expanding from Standard to Mini and then Tiny and now Australian Bernedoodles. While their popularity is growing, they are still relatively uncommon. Well-bred Bernedoodles tend to blend the best attributes of the Bernese and the Poodle. They are fun, friendly, playful, goofy, sociable dogs. In other words, the perfect companion dogs! Gentle around children and the elderly, these dogs just seem to know what people can handle. In fact, they make excellent therapy dogs as they are easy to train, very intelligent and love to work. Bernedoodles do need to be taught right from wrong. Because they are very intelligent and sociable, a lack of training or human interaction can lead to problems. Purebred Bernese Mountain Dogs can be strong-willed, and that trait may also show in the Bernedoodle. Training and exercise will make both owner and Bernedoodle happy. Most Bernedoodles have a moderate activity level. They love to play, run, hike and fetch, but when it’s time to relax, they definitely have an “off” switch. These are social, loyal dogs, and do best when fully integrated in your life. Like most dogs, they want to be with you and part of the action. The Bernedoodle and Goldendoodle are quite similar in that they are intelligent, social, fun, playful, friendly, and goofy crossbreeds. Both have incredible character and charisma. The most notable difference I’ve seen between the two is that some Bernedoodles can be a little headstrong, a trait they likely take from the Bernese. This is more pronounced at the puppy stage and tends to disappear when the Bernedoodle is older and trained. Further, I am working hard to find the most easygoing Berners for my breeding program; as a result, the stubborn streak is becoming less common. Most Goldendoodles enjoy the water because both parent breeds do. Bernese Mountain Dogs are generally not big fans of the water, so while many Bernedoodles enjoy swimming, some don’t gravitate to it. The Bernedoodle tends to feel the heat a little more than the Goldendoodle, but nonetheless, both do well in warm climates. A cooling mat or k9 cooling coat found at http://mustluvdogs.ca will make a hot Bernedoodle more comfortable. These are fairly minor differences. Remember, every puppy has a different personality—and with hybrids, you are getting a blend of traits from Poodles and Bernese. But when considering the overall characteristics of both dogs, I find Goldendoodles and Bernedoodles to be quite similar. For both crosses, the curlier the coat the less they shed, and the better they are for people with allergies. Most ’doodles have wavy to curly coats and are very low to non- shedding. At SwissRidge Kennels, I ask what you are looking for in terms of coat type and temperament, and match you to the best puppy for your family. Bernedoodles tend to be pure black, black-and-white, black-and-brown or tri-colour (black, white and brown). I’ve seen other colours, but they are uncommon. Bernedoodles come in different sizes, depending on the parents and the vagaries of genetics. Females are usually smaller than males. 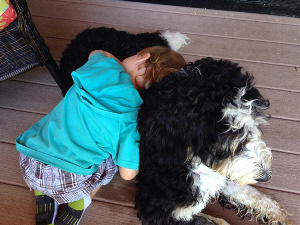 Standard Bernedoodle – results from crossing a Standard Poodle with a Bernese Mountain Dog; will generally be 50 lbs. and up, and around 23-29 inches at the shoulder. Most standards are in the 70-90 lb. range. Mini Bernedoodle – results from crossing a Miniature Poodle with a Bernese Mountain Dog; will generally range from 25-49 lbs. and be 18-22 inches at the shoulder. Tiny Bernedoodle – results from crossing a Toy Poodle with a Mini Bernedoodle; will generally range from 10-24 lbs. and is about 12-17 inches at the shoulder. These ranges capture the averages; sometimes a pup will fall outside the expected height and weight. A good breeder will perform all clearances listed above and will share all health certificates with potential clients. If a breeder is unwilling to show you health clearances of the parents, consider it a red flag. I’ve heard about dogs with grade four hip dysplasia who are healthy, happy and jumping around. There is no way someone could have known they had hip dysplasia if the dogs hadn’t been tested. Imagine if I were a disreputable breeder and didn’t get these dogs tested and sold you a pup out of one of these parents. ASK TO SEE CERTIFICATIONS. provide you with references from clients, other breeders, veterinarians, etc. ask questions to help determine if you will provide a great home to their pups. Responsible breeders care about their pups and where they are going. F1 – is a first generation cross, in which the pup is 50 per cent Bernese Mountain Dog and 50 per cent Poodle. The F1 cross is considered the healthiest, as the parents have the least likelihood of contributing genes for common inheritable diseases. F1b – is a backcross in which a Bernedoodle is bred with a Poodle. The puppy is 25 per cent Bernese, and 75 per cent Poodle. F1b puppies are the most likely to be non- shedding and allergy-friendly. Some breeders have backcrossed a Bernedoodle with a Bernese, which results in a dog with more of the Bernese traits. I prefer not to breed this backcross as there is a greater likelihood of shedding. F2 – is a second-generation cross, in which an F1 Bernedoodle is crossed with another F1 Bernedoodle. If this is done for 7 generations you can apply to register this dog as a purebred. The closer the generations come together the more consistency there will be in the lines, but the genetic problems of the purebreds are more likely to reappear, and hybrids vigor diminishes. Some F2 pups may have an improper coat—not the fleece we love in the ’doodles. While Bernedoodles vary in appearance and coat type, an experienced breeder will be able to give you an idea of what the pup will look like as an adult, based on what the parents have produced in the past and what traits they see in the pup. In terms of temperament, Mini and Tiny Bernedoodles may have a slightly higher energy level than the standard, to reflect the same in the Miniature and Toy Poodle parent. However, using calm Poodles, regardless of size, tends to produce docile Bernedoodles. As pups, the tiny and mini ’doodles are more outgoing and take a little more work, but as adults they tend to calm down. The nice thing about the mini doodles is they are a great size and you can take them almost anywhere. They are great city/condo dogs. Large dogs cost more to maintain, from food to vet care. Plus, they tend to be shorter-lived. Beyond that, all sizes of well-bred Bernedoodles have great temperaments, love to play fetch, and hike, are great family dogs and awesome with kids. Males tend to be larger than females, but beyond that, there is not a major difference between the genders. Males tend to be more affectionate, goofy, but also a bit more stubborn. Females tend to be more independent but easier to train and less stubborn. These differences are actually quite subtle, and both males and females make amazing pets. I think temperament is more important than gender when matching dogs to owners. Like Poodles, Bernedoodles have hair, not fur, and shedding is minimal or non-existent. That’s the upside. The downside is that it does need to be brushed regularly to prevent matting, and clipped every 8-12 weeks, or so, depending on your preferences and the dog’s activities. If your Bernedoodle is very active outdoors, you will likely find a shorter clip easier to maintain. But many owners enjoy the bonding time of regular brushing and choose to keep their Bernedoodle in a fuller coat. Generally speaking, a curly coat is less likely to shed but more likely to become matted if not brushed regularly. Daily brushing will probably be required, as well as professional grooming every 8-12 weeks. Make sure to be very specific with the groomer as to how you want your dog groomed; most groomers will not have encountered a Bernedoodle and may default to a standard Poodle clip unless directed otherwise. Be specific and show the groomer photos of how you want your dog to look. I’ve included advice for groomers in my book. You should take your pup to the groomer only after its full set of vaccines (at around 14- 16 weeks). To get them used to the process, ask the groomer not to use clippers. Just have the pup bathed, clean the ears and cut the nails. The next time you visit, you can have the pup clipped. Avoid bathing your Bernedoodle too often, as it strips essential oils from the coat. While there is no such thing as a fully-hypoallergenic dog, Bernedoodles tend to be allergy-friendly. Most people with allergies to dog dander (i.e., those who experience sneezing, watery eyes) are fine with a Bernedoodle. Every Bernedoodle has a different coat. The curlier the coat the less it will shed. Most Bernedoodles have the wavy type coat that is low- to non-shedding. Straight Coat: like the Bernese coat – it may have a slight wave to it. This coat will shed—less than a Bernese, but noticeably. I see very few pups with straight coats. Wavy Coat: Most Bernedoodles have a wavy coat, which gives them the typical ’doodle look. This type of coat is low- to non-shedding and fine for most people with allergies to dog dander. Curly Coat: Similar to the Poodle coat and will not shed. A curly coat is your best bet if you have more severe allergies to dander. If you are allergic to dog saliva, however, you will most likely be allergic to both Bernedoodles and Goldendoodles (I find this depends on each dog’s saliva make-up). You will know if you are allergic to salvia if your skin will break out in hives when a dog licks you. If you still want a dog, it would be best to go with a smaller dog (’doodle or otherwise) as they produce less saliva than larger dogs. I always suggest that prospective clients meet some Bernedoodles if they can. The SwissRidge Facebook Group is a great place to find Bernedoodle owners in your area. Further, like most responsible breeders, I allow people a couple of weeks to see if they are allergic to their puppy and to return it if there’s a problem. This has happened very rarely. As a breed, the Bernedoodle is still young, so there is limited information about longevity. Since I started breeding them in 2003, however, I have seen very few health concerns, and it appears that hybrid vigor is indeed at play in creating a hardy dog that will be with you for a long time. At this point, I can only estimate an average lifespan. I predict that Standard Bernedoodles will live 12-15 years, Mini-Bernedoodles up to 17 years and Tiny Bernedoodles up to 18 years. Usually, the smaller the dog the longer it lives. As a breed, the Bernedoodle is still young, so there is limited information about health concerns. Of the hundreds of Bernedoodles I have bred in the past decade, however, only a few owners have reported a genetic health concern, none of which has been life- threatening. 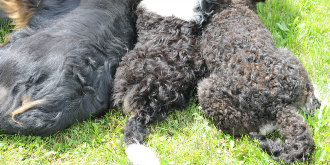 I have not seen a case of cancer in my Bernedoodle lines since I started breeding them in 2003. While Bernedoodles tend to be healthier than their parent breeds, they can still be prone to conditions such as hip and elbow dysplasia and certain eye problems. Skin problems, such as hot spots and allergies, are also seen in this mix. Genetic testing can reduce the risk of many diseases. A reputable breeder will perform a number of tests and provide evidence of the successful results. It’s important for prospective buyers to understand that breeders invest a great deal of money upfront in finding healthy breeding stock and doing the required testing. This investment is usually reflected in the higher cost of the puppy for the buyer. A higher upfront cost will most likely reduce vet bills down the road. Please do your research and make sure breeders are performing the testing below. 6. Von Willebrand Disease – if not cleared through parentage. Elbows have become a recent problem in the Bernese, and you may find many older health-tested dogs will not have elbow clearances. To continue to keep up with the research and the recommendations of the breed Association, all new Bernese certifications should have elbows cleared before breeding. * Thyroid malfunctions – Not Required but a highly recommended test for all breeding dogs. 1. Hips for Hip Dysplasia and Legg-Perves Disease OFA, PennHip or OVC 2. Bernedoodles require a moderate amount of exercise. Most will do well with three half- hour walks per day. They’ll enjoying hiking with you in the summer, snowshoeing in the winter, city walks or country runs. Then, when you sit down for a rest, they’ll happily join you for a cuddle. They are very versatile and social dogs. You can take them almost anywhere and they acclimatize well to new situations. Yes, every SwissRidge dog needs to be spayed/neutered. If you would like a dog for breeding, I make exceptions in certain situations. non-breeding agreements, unless arrangements are made beforehand. If anyone who has signed a non-breeding agreement and subsequently breeds the dog, there are serious implications. SwissRidge guarantees all dogs for two years against hip dysplasia or any hereditary disease. If your dog develops a hereditary disease that makes it unsuitable as a pet or in need of extended veterinary care, please contact me immediately. I am extremely concerned about the health and welfare of each and every pup, and need to be informed so that I can make decisions about future breeding. You may choose to provide a note from a board certified veterinarian. I will either replace the dog, or refund half the purchase price of the pup to cover any extended veterinary care. This is your decision. This is a mixed breed dog and therefore cannot be registered with the American or Canadian kennel clubs. I intend to continue to produce healthy, gorgeous, great-tempered Goldendoodles and Bernedoodles in all sizes, as long as they are beloved by dog owners. At the same time, I am working to develop a unique “SwissRidge Doodle” that will represent my kennel by combining my favorite breeds in a perfect, medium-sized, tri-colored, non-shedding package. It goes without saying that the SwissRidge Doodle will have an excellent pedigree. I am planning to use some dogs from my own thoroughly-tested, long-lived lines to produce this special hybrid. I am making carefully staged progress toward this vision, one exceptional dog at a time. I have a few special pups in what my clients jokingly describe as my “Puppy Vault.” As they mature and pass their clearances, I can take another step. If all goes well, the first litter of SwissRidge Doodles will be born in 2015. But I expect this line to continue to evolve. I consider myself a breeder-inventor and as such am never fully satisfied. An “Australian Bernedoodle” is a cross between a Bernese Mountain Dog and an Australian Labradoodle (ALD). Australian Labradoodles are hybrids themselves—a blend of Labrador Retriever, Cocker Spaniel, Irish Water Spaniel and Poodle that originated in Australia. For a dog to be recognized as a ALD, it must have lines originating from either Teegan Park Kennels or Rutland Manor Kennels. Well-bred ALDs are registered through the American Australian Labradoodle Association (ALAA), which has strict standards for breeders, and requires health testing for all breeding dogs. Most ALD breeders spay/neuter pups before they go home. While views vary on whether this is a good practice, it does have the benefit of preventing inbreeding and keeping the lines healthy and strong. A well-bred ALD typically has a non-shedding “fleece” coat, like a Poodle. They come in all sizes. My current ALD sire, Levi, is on the small side, as I want to use him to breed small- to medium-sized pups. His Australian Bernedoodles will likely fall into the range of 30-60 lbs. Generally speaking, an ALD has a similar temperament to a Goldendoodle—sweet, easygoing, intelligent, family-oriented and goofy. Levi has a wonderful, loving personality and I expect him to contribute those traits to the Australian Bernedoodles. It’s important to note that the ALD is different from a direct cross of a Poodle and a Labrador Retriever, usually called simply a Labradoodle. I have crossed Poodles and Labs in the past and was not pleased with the result. In my experience, the Lab-Poodle cross tended to have a more wiry coat, a higher incidence of shedding, and wasn’t as highly motivated to please its owner. I far prefer the Goldendoodles and ALDs hybrids as companion dogs. Some people wonder if there is Australian Shepherd in the Australian Labradoodle. The answer is no. I would not include Australian Shepherds in my program as they have a very high drive to work; working dogs tend to be high strung, and need a job. I prefer my dogs to have a low working drive, as their main job is to be a great pets and companions. I decided to infuse Australian Labradoodle into my lines because I was becoming discouraged with the challenge of finding quality Miniature/Toy Poodles. Health testing is a priority for me. I like to make sure all my lines are health tested at least 3-5 generations back—and most go back much further. Despite great effort, I have had a hard time being able to accomplish this with Poodles. In particular, it is very difficult to find breeders who do health testing on Miniature Poodles. It is also difficult to find Miniature Poodles with the calm, docile temperament I need for my program. In view of these challenges, I decided to explore a different approach to creating Bernedoodles by crossing Bernese with the ALD. Reputable ALD breeders must health test their dogs if they belong to the ALAA. In addition, reputable breeders can produce docile dogs with the fleece coat I need for my lines. I currently own one ALD sire, Levi, and I am fully confident in his pedigree and temperament. Levi’s first litter in early 2014 produced five stunning pups, with lovely, wavy, non-shedding, fleece coats. They have blocky builds, with great proportions and square heads. Temperament testing showed all five to be fun, playful, calm and loving. Subsequently, owners have commented that the pups are sweet and easy to train. I expect to see several more litters from Levi in 2014. Over time, and with input from owners of his pups, I will be able to decide whether or not to pursue ALDs further in my breeding program. So far, so good. But one litter is just that. I need to see many more before drawing firm conclusions. At this point, there are too few Australian Bernedoodles to draw firm conclusions. I was very pleased by my first litter and will be following them closely as they mature. I anticipate that they will have lovely temperaments because Levi is a wonderfully calm and a sweet sire. However, that can also be said of all my current Miniature Poodles, which I’ve chosen with great care. I imagine that Levi’s offspring will be quite similar to Dizzy’s or Loki’s, for example. As a breeder, I am always on the lookout for promising leads to produce healthy, beautiful dogs. I will evaluate Levi’s pups over time, just as I do those of every other dog in my program, and make decisions accordingly. Input from owners is critical in helping me make breeding decisions. I wish I could meet the demand for Bernedoodles more quickly, I really do. I realize it is stressful for people not to be able to nail down a timeframe for their pup’s arrival, and that a year, give or take, is a long time to wait for a puppy. But there’s a reason my Bernedoodles have become so popular: they’re beautiful, they’re healthy and they have great temperaments. That’s not idle bragging; every single day I get e-mails telling me about how much people love their Bernedoodles. As I explained in my book, however, it takes time to create a great breeding program. I’ve been developing my Bernedoodles lines very carefully since 2003. Excellent breeding stock is incredibly hard to come by, whether it’s Bernese or Poodles of any size. There are no short-cuts. I have to track down breeding dogs with potential from reputable breeders, wait like everyone else for pups to be born, raise them, test them for health and temperament, and only then can I breed them. If a dog doesn’t work out for any reason, it’s back to the drawing board. I’m always at the mercy of Mother Nature. Dogs come into heat only twice a year. Bernese are known for unpredictable heats and for failing to conceive when expected. Even when they do, their litters may be smaller than hoped, and the sad truth is that they are not the best moms. Despite diligent interventions (bottle-feeding is more the rule than exception), not all pups thrive. When a large litter arrives and thrives, I rejoice, but it may not produce exactly the pup you’ve requested. When your number comes up, if you’ve identified a tri-colored female with a curly coat and the litter hasn’t produced one, you may be out of luck at that time. Even if the litter produces a pup with the right specs, but it has the wrong temperament for your circumstances, I will encourage you to wait. It’s worth waiting to have the right puppy. But please do keep in mind that a pup with the ideal temperament for you may come earlier if you are open-minded about gender, coat type and color. Eventually, nature will produce a pup to your exact specifications. If you can be flexible, however, chances are good that your number will come up faster. Many clients decide that black-and-white pups, fondly described as “Oreos,” will suit them just fine, and end up with a pup far sooner than if they’d held out for a tri-color. An owner says… “Another reason the wait is worth it is that Sherry is personally evaluating the temperament of each puppy and reviewing individual applications to make the right match. I realize more and more people are wanting one of these amazing dogs, but I also recognize that there is a limit to the number of puppies that can receive this screening process. SwissRidge cannot just increase puppy production without sacrificing the quality of care and the unique matchmaking process. I hope that everyone gets a dog, but I also hope that Sherry will never expand beyond her capacity of provide the individualized adoption process that has been so successful. You will have a wonderful doodle! So, while the wait may be long, I’m hoping that my clients understand that I am breeding the very best dogs I can, in terms of health, pedigree and temperament. All the time and work that goes into producing a quality pup will pay off when a client tells me their long-awaited pup exceeds their expectations. While the wait may be frustrating, it does allow people to think about their decision very carefully. Getting a puppy is a major life change, and not something to be done on impulse. During the wait for your SwissRidge Bernedoodle, you can do some reading, find a vet and a trainer, get all necessary supplies and figure out exactly how you will handle your pup day-to-day. I will say that people appear to be far better prepared now for their pups than they used to be. So the wait has had an unintended upside! Many breeders allow clients to choose their puppy from a litter, often in the order of deposits made. I used this approach myself when I started out, but I found that people tended to choose pups with their hearts, rather than their heads. This is not the best way to select a companion that will be with you for well over a decade. No matter how much I tried to steer people towards the pup I thought would best suit their circumstances, they usually chose the puppy they found the cutest. Frequently, people let the puppy “choose them.” The pup that galloped over and showered them with kisses was “the one.” Needless to say, the puppy that’s first to approach a stranger tends to be the boldest and most dominant in the litter. While this temperament suits some people, for many, a lower key puppy is a far better fit. I knew there was a better way to match people and puppies, so I devised a system that has allowed me to improve the success rate of puppy placements. Now, I evaluate a puppy’s personality using both observation and a formal temperament test, and match it against the adoption forms completed by prospective owners. I take this process very seriously, because I know that the wrong puppy can bring stress to a family. It’s a huge leap of faith for people to trust me to know what puppy is best for them. I consider that trust an honor and I do my very best to live up to it. Happily, my approach has worked amazingly well. Since implementing my “match- making” system, I can count the number of puppies returned on one hand. And several of those involved allergies, or changes in family circumstances. For the first few weeks of a pup’s life, I keep a low profile, allowing pups to learn how to be a dog from each other and their mother. We handle pups from day one to get them used to human touch and enhance bonding. Because my kennel is large, and I often have multiple litters at the same time, I have staff that help with this important aspect of puppy care. I make sure to consult with everyone to gather perspectives, as we may see the pups at different times in the day. A pup’s personality starts to show at the age of four to five weeks. Like most breeders, I have an intuitive understanding of puppy temperament from observing so many litters over the years. From the age of 5-8 weeks, in particular, I look at where they rank in their litter, how they interact with their mother, their littermates, and their caregivers. Do they sit back as you come in, or are they the first to come up, jumping at your hand? When they’re tumbling around with their littermates, are they always on the bottom or the top? Are they starting the fights, stopping the fights, or just walking away? The answers to these questions tell me a great deal about their personalities. A puppy that is relentlessly picked on by its littermates, for example, is likely to have a more submissive nature as an adult and be the omega of the pack, regardless of all the socialization and training it might receive. But that personality will be perfect for one of my clients, perhaps a retired person with a quieter lifestyle. The boldest pup in the litter, on the other hand, will be perfect for an athletic young couple that is constantly on the go. Most of the puppies—like most of my clients—rank somewhere in between. While I understood much of this intuitively, I wanted a way to formalize and quantify it. I decided to develop an assessment based on the Volhard Puppy Aptitude Test, or PAT. Jack and Wendy Volhard are internationally recognized experts in dog training, health, and nutrition. They believe that if their test is administered at exactly seven weeks—the point at which the dog’s neurological development is complete, yet it hasn’t learned much about the world—it will accurately predict inherited behavioral tendencies and how the puppy will turn out as an adult. Although I have adapted the test slightly to suit my needs, like the Volhards, I assess the following in each puppy: attraction to people; comfort with restraint; startle response; acceptance of social dominance by a person; acceptance of dominance while in a position of no control; willingness to do something for you; and degree of sensitivity to touch, sound, and sight. Each element is scored out of 6, with 1 being the boldest, and 6 being the most timid. A pup that scores mostly in the 1-2 range will be quite dominant and best suited to experienced dog owners who know how to lead. A pup that scores mostly in the 5-6 range will be quite independent and shy, and suit a quiet, structured home. I average the results across all elements of the test to get an overall ranking for each puppy. Since I began using the test, all of my pups have fallen within the range of about 2.8 to 4.4. The majority fall between 3.2 and 3.8, and I have found pups in that range to be best-suited for my clients. In fact, I work very hard to find the right breeding stock to produce exactly those mdiffabernalabiddle-of-the-road puppies. Subtle variations in the scores can make all the difference in matching dogs to owners. A puppy that ranked 3 is likely to be significantly more active and dominant as an adult than the one that ranked 4. Of course, I also factor in everything I’ve learned through close observation of the puppies when making final assessments. By the time a pup reaches 7-8 weeks, I have a very good idea of what it’s going to be like as an adult, assuming it gets the proper socialization and training in its new home. Training actually plays a critical role in helping a dog achieve its full potential and become your perfect dog. It’s important to establish your leadership the moment a pup enters your care, and maintain it consistently through your life together. Obedience training will improve your bond, and help the puppy integrate into your lifestyle. Even with a well-matched puppy, it takes work to raise a good dog. But it’s so worth it! Once I’ve done the temperament test and gathered observations, I read the adoption forms and study them carefully. People generally provide a very detailed description of their lifestyle, as well as their preferences, in terms of color, coat type, size, and gender. I look at their family composition, experience with dogs, day-to-day schedule, and activity level. It’s important to view the family as a whole, and see where the dog would fit in. I also need to take into account any allergies and determine the best coat type. Then I find the optimal pairing of the available puppies with the prospective owners. When I am torn between two potential pups, I will often describe both and allow my client to make the final decision. Even a slight nuance in personality can make a difference in fit, so I do my very best to consult and include the client. I stand behind my dogs and my decision-making, and if for any reason, someone needs to give up their dog, it always has a home with me. I have successfully re-homed the very few dogs that have been returned. If you are interested in a SwissRidge Bernedoodle, please fill out the Adoption Form located here. The information you supply will help me decide what puppy would suit your needs. If your adoption form is approved, I will contact you and request a $300 deposit to reserve a puppy. Deposits are NON-REFUNDABLE unless I am unable to offer you a pup within two years of the date of your deposit. If you decline a pup when it becomes available, you may lose your deposit unless you roll your deposit toward a future litter. You will lose your deposit if you cancel at the last minute and I have already booked the flight. I view a deposit as a sign of a client’s commitment to me that they want a puppy from my kennel and are willing to wait as long as it takes for a SwissRidge puppy. I base the number of breedings each year on the deposits we have, so that supply never exceeds demand. I want to be certain that all my puppies have good homes. Making deposits non-refundable also encourages people to think long and hard about whether getting a puppy is the right choice for them before taking the step and getting on the waiting list. I run a very structured breeding program—and it works. I have never not placed a puppy in a good home. However, I do recognize that a client’s preferences or life circumstances may change after making a deposit, so you may choose to switch litters or transfer your deposit to another breed. Further, you may defer adopting a puppy until your life circumstances are just right—even if that takes years. As an example, if you reserve a puppy in 2014, but decide to wait three years to adopt, your deposit will still apply in 2017. However, if my prices have risen in the meantime, your deposit will be deducted from the higher price. The price quote you are given at the time of deposit applies for only one year. I only allow visitors to my kennel on the day people pick up their puppies. My first priority is protecting the health and safety of my dogs, and I cannot risk introducing disease. Many breeders have been devastated by Parvo that was unwittingly carried in by visitors. I understand that people want firsthand knowledge about the parents and kennel before they purchase a puppy. That is why I include so many references on my website, and encourage prospective owners to contact them. In addition, there are 2,500 members on the SwissRidge Kennel group on Facebook, where you can engage with owners directly. Many owners have visited the kennel and met me and the parents of their pups. Please join the group and ask questions about anything on your mind. You’ll be amazed at the speedy, frank and thorough responses—I always am! Please contact me for information about pricing for the specific type of Bernedoodle you’re interested in adopting. You can find a copy of my Contract on the Puppies menu tab. Yes, I think pet insurance is very important. Even though we do everything in our power to make sure you are getting a healthy puppy, accidents can happen. With every puppy I sell, I provide a sheet for a 30-day free trial of pet insurance. To sign up your puppy for this trial, click on here for the Trupanion website. The price of my dogs reflects my credentials, knowledge, skills, investment and excellent track record as a breeder. I am fully confident in the quality of my dogs and my ability to provide excellent service to my clients. While I constantly strive to improve, clients are so satisfied with their SwissRidge experience that they are increasingly coming back for a second dog, or even a third. I believe I have the best breeding program around, and I’ve invested a great deal of time, effort and expense to make it so. I source dogs from all over North America and Europe, and have visited hundreds of kennels in person. I research pedigrees five generations back—more where possible—before deciding whether to buy breeding dogs that typically cost from $5,000-$20,000. Few breeders go to such lengths to find their stock, but this approach has allowed me to gather some of the finest dogs from varied, quality lines. I raise my breeding dogs to maturity and then invest more in testing for genetic diseases. In the meantime, I constantly assess the temperament of my dogs to make sure I’m only breeding those that meet SwissRidge standards. If any breeding dog I purchase does not pass health or temperament testing or fails to develop into the dog I expected it to be, I don’t use it in my program. Further, if a dog that I deem to be excellent doesn’t produce the quality of pups I expect, it is retired. I work very hard to breed the best dogs to produce healthy, happy pups, and then I individually match them to your unique circumstances. It’s a comprehensive, exhaustive approach, but I wouldn’t have it any other way! Creating the Bernedoodle and building a solid program over the past decade has been very rewarding, but also complicated, labor-intensive and costly. It has taken a lot of trial and error to try and breed the perfect Bernedoodle, and I’m still learning. I can’t imagine anyone having more knowledge of this hybrid than I do. I know what to look for in breeding dogs, how to match the right dogs and what my matches will produce. On top of all that, I operate a large, busy kennel. My dogs live in immaculate conditions, get plenty of exercise and individualized attention, and are fed very high quality food. As a veterinary technologist, I know how to provide the best care for my dogs. That dedication has meant I’ve passed each annual kennel inspection with flying colors. The key to providing this level care is great staff, and plenty of them. I’ve been fortunate to find some wonderful dog-lovers who care nearly as much about my dogs as I do. They work very hard to keep adults and pups happy and healthy, and provide the socialization and playtime puppies require to develop into well-rounded pets. Staff are on duty from 7 a.m. to midnight tending to every need of the SwissRidge pack. I even employ a full-time groomer to make sure my dogs always look their best! Beyond this, I also make sure we offer high quality customer service to all SwissRidge clients. That means answering any and all questions related to health or behavior of my dogs once they’ve gone home. With my partner being an expert dog trainer, I find we can address nearly every issue that comes our way. In short, I believe my prices are appropriate. 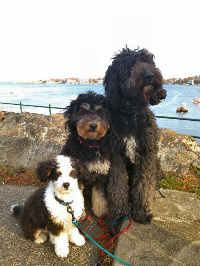 When buying a Bernedoodle puppy from SwissRidge, you are choosing to go with the breeder with the deepest knowledge of this hybrid—a breeder with premium breeding dogs, and one who stands behind her dogs and her clients for life. Investing upfront in this important member of your family will likely avoid costs down the road. A well-bred, carefully raised puppy will be a healthy member of your family. There are few surprises with a SwissRidge pup. We accept both Canadian and US currency. SwissRidge contact information is posted on the CONTACT page.